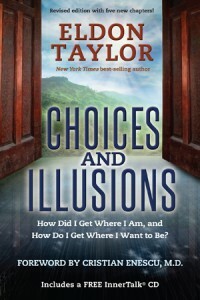 Ted A. Moreno, reviews Choices and Illusions by Eldon Taylor. There is an allegedly factual account that when the Spanish galleons approached the New World, they were invisible to the Aztec people. When the conquistadors approached the shore with helmets on their heads, they were perceived by Montezuma and his people as gods walking on water. One of the Aztec sages was able to see the ships only after several days of just staring at the water. Did you know subliminally flashing a smiling face on a foreign flag predisposes one to feel more favorably about the country the flag represents? Marketers know that men will judge an automobile to be faster than others if a beautiful woman is draped over the hood. Are you aware that President Obama used a “kind of dream team” of behavioral scientists in his campaign that included psychology professors from major universities around the country? In the book “Choices and Illusions: How Did I Get Where I Am, and How Do I Get Where I Want to Be?”, author Eldon Taylor, cites these and other examples of how our minds work as well as how we are manipulated without our awareness. More importantly, through understanding how illusions and false perceptions function in our lives as powerful influences over our thoughts and behavior, Taylor offers valuable perspective and direction as to how to discover the deeper power within us to create our own lives. This book was sent to me unsolicited by what must be Taylor’s PR team. Although I’m trying to finish a number of books right now, after flipping through some pages of Choices and Illusions, I was drawn in by chapters with titles such as “Who Owns Your Thoughts Anyway?”, “Practical Hypnosis” and “Breaking the Trance”. I found that Taylor’s premise is well aligned with my own growing perception that so much of what we think of as real is in reality illusion, “engineered beliefs”, and cultural hypnosis on an unimaginable scale. Taylor asks the question “Who Owns Your Thoughts Anyway?” Our immediate assumption is “I do!” Yet the evidence that Taylor presents suggests that we may not, and that what we think of as our ability to freely choose is simply an illusion, and that many of our choices have been predetermined by past history, advertising, and conditioned perception. All are programs running beyond the edge of our awareness. I found “Choices and Illusions” to resonate highly with my own ongoing explorations into the nature of reality, the workings of the mind, hypnosis, self talk, and the nature of consciousness including metaphysics. To choose powerfully means to do so with full awareness including a clear view of our biases, preconceived notions, and deeply held beliefs. Taylor challenges us to “break out of the trance” and provides guidelines for creating lives of freedom, intention and wholeness. https://tedmoreno.com/wp-content/uploads/2013/10/bookcover_smaller-200x300.jpg 300 200 Ted Moreno https://tedmoreno.com/wp-content/uploads/2018/05/The-Moreno-Method.jpg Ted Moreno2013-10-11 16:14:052018-05-30 21:01:09Book Review: "Choices and Illusions"
Hypnosis 101: How Does It Work?